New Year, New Name and Amazing People! We are super excited about 2019! The past five years have been amazing for us and more importantly, for the lives we’ve been blessed to be a part of! We have experienced tremendous growth. So much so, that it required us to re-brand from Circles to Building Bridges in order to expand our reach and our curriculum. Poverty is much more than simply a lack of material resources, and it takes much more than donations and handouts to solve it. That’s why we remain laser-focused on changing the big picture on what people think about poverty. People are learning what poverty is vs. what they’ve always thought it was. This is creating a more empathetic community and creating fewer barriers for people experiencing poverty. The foundation that has been laid by people such as Ryan Melton, Teddy Steen, and David Heltzel, the endless blood sweat and tears put in by our Coordinator, Laurie Mitchell, and the true passion that you witness by our extremely active Board Members, Scott Vorhees, Terry Wachter, Jay St. Clair, Nancy Bettasso, Kevin Badgley, Gary Bandy, and Garen McMillian, their depth of commitment to make a difference in the lives of others is immeasurable. All of our amazing Allies who not only selflessly support our participant’s efforts through networking, listening and offering guidance but actively create social change within our community. We also have a multitude of volunteers that are our true unsung heroes, people such as Barbie Huff who facilitates classes every week, Christy Herrin-Hamilton and her contribution to our Board as well as her priceless knowledge on finances and budgeting, and Sue Ginsburg our resident volunteer coordinator, data analyst, and curriculum developer. Our selfless childcare providers who high-fives and listens and have the patience of Saints, Belinda Belk, Ruth Blake, Jan Crandon, Amanda Eckman, and Casi Nelson, as well.Rebecca Culver and Sara Ellis.We are forever grateful! We have also come to love the relationship we’re building with the medical students from our local KCU Medicine & Biosciences campus. They have been a tremendous help with our children’s program. And we would be remiss if we didn’t give a shout-out to the different organizations across our community that have provided family-style meals each week, a HUGE THANK YOU to: Joplin Elks Lodge, bible study groups with St. Paul’s Church, The Light, Soroptimist, Rotary, Kiwanis, Forest Park, First Presbyterian’s “Be Team”, Mercy, Freeman Health System, Southwest Missouri Bank, Arvest Bank, AT&T, MaMa JJ’s, Liberty Utilities, Mark Farmer, and JACC Young Professionals. We wouldn’t be where we are today if it hadn’t been for each and everyone of you and that’s why the core of what makes Building Bridges so successful will never change – at the end of the day, it’s about relationships. And it always will be. Why is it difficult to accurately describe what we do at Circles? I always tell people the best way to explain it is to come to any one of our Thursday evening classes. It’s there that you’ll experience the magic of Circles. Having said that, Circles itself really doesn’t do anything other than provide the tools, it’s all the Leaders that do all the work. It’s also important to understand that we focus on far more that financial poverty. We dive into poverty as it relates to relationships/social capital, spirituality, health and wellness, self-esteem, etc. I thought one way of sharing what it looks like to work your way out of poverty, whatever kind of poverty you may struggle with, would be to share a few photos of what our Circle Leaders accomplished throughout 2018 while they worked through our comprehensive programming and social capital model. Our Leaders applied the tools they were given by creating S.M.A.R.T. Goals and placing their goals into action. They were surrounded with Allies, also known as social capital, to walk along side them and cheer them on in their journeys. Some of our leaders bought their first home, some dramatically increased their income, others dramatically decreased their debt, a few earned their college degrees, but most importantly, all of them improved the relationships in their lives. And isn’t that’s precisely what we’re all about, healthy relationships! Class 8 recently celebrated their completion of 16 weeks of intensive training and graduated from the first phase of their Circles program at St. Paul’s United Methodist Church. We wanted to recognize and publicly congratulate all 9 graduates (Circle Leaders), Charles & Sonya Anderson, Jessica Crabb, Melanie Eliff, Shamera Moss, Pamela Hunter, Lisa Laster, Brandi Lawson and Sam Newton – the excitement and transformation is just beginning. Each graduate will be paired with at least two Allies that will come along side them, lock arms and support them as they continue to lead their lives out of simply surviving, to living a life of pure abundance. We also wanted to give thanks to the many, many community allies and volunteers that inspire and equip individuals and families to move from surviving to thriving. It is a life changing experience for the Allies and Circle Leaders, and after all, it’s a hand across, not a hand out! At Circles we build relationships, we figure out how to do life better. We find better ways to budget, resolve conflict, and improve our health (both physical and mental). We are blessed with the gift of watching individuals and families transform their lives and their families’ lives in ways they never thought possible! The staff and residents of God’s Resort in Joplin are great friends to us at Circles and we’re excited to pass on some information on a true milestone in the history of their facility! Join in on the celebration of “What’s New and Good at God’s Resort” Friday, October 12th at 6 pm, Saturday, October 13th at 10 am, and Sunday, October 14th at 2 pm. Their new Five-Plex will be dedicated at the God’s Resort Community Center, 1501 S. Pearl at each of those days and times. The children of our Circles Leaders recently spent some quality canine time thanks to a visit by local therapy dogs and their trainers. Sue and some of the staff from Lucky Dog introduced the pups to the Circles kids. Meanwhile our Leaders were learning how best to tell the story of their new lives by motivational speaker J. J. Spurlin. Thursday, August 30th, Circles of Joplin was thrilled to be the beneficiary of checks from fund raising efforts of three area organizations. 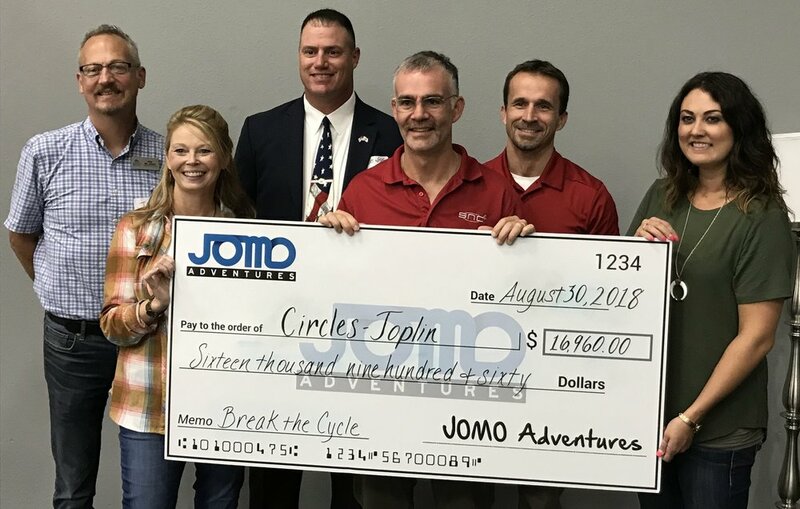 JOMO Adventures, the Joplin Elks Lodge, and SNC Squared presented Circles of Joplin with checks that, combined, equalled over $18,000. Everyone associated with Circles of Joplin were ecstatic to see such strong community support. It was a night full of appreciation on February 22nd, 2018 when Circles of Joplin held their first ever Volunteer Appreciation banquet. As part of the 2018 five year anniversary of Circles of Joplin, past volunteers were honored by current (and former) Circles Leaders and Allies. Bud Sexson, Circles of Joplin's first Board Chairman, was joined onstage by Renee White, another early Circles Board member. Bud and Renee told the story of how the initial concept of Circles organized and developed. From our children's division, Crystal Hope composed a special song for the evening titled, appropriately, "Thank You," which she then performed, accompanying herself on acoustic guitar. Chairman of the Circles Board Scott Vorhees was on hand to offer the Board's sincere appreciation for all of the volunteer work that has benefitted Circles immeasurably over the past five years. All of that and a great dinner as well! Everyone at Circles of Joplin wanted all of our volunteers to know that the work couldn't even begin to be done without them. Lives are changed every day thanks to the hours, days, and weeks of thankless volunteer work for Circles. Well, maybe not "thankless" any more. Thursday, February 22nd was our attempt to thank so many people who have given so much. It was great to see so many folks out at the first Third Thursday of 2018 on the 15th in downtown Joplin. Our circular hat is off to John and Emily and the gang at Atlas Safe Rooms! They were kind enough to lend Circles some space in their booth. We were able to spread the word about the wonderful things Circles has accomplished and, hopefully, we talked a few folks into checking us out some Thursday night at St. Paul's United Methodist Church.